As December rolls around so does the hype for christmas coffee cups and festive menus. Whilst bringing a lot of excitement these festive menus also come with high calorie and high sugar contents. I'm not suggesting that you abstain completely but they certainly shouldn't be a December staple. 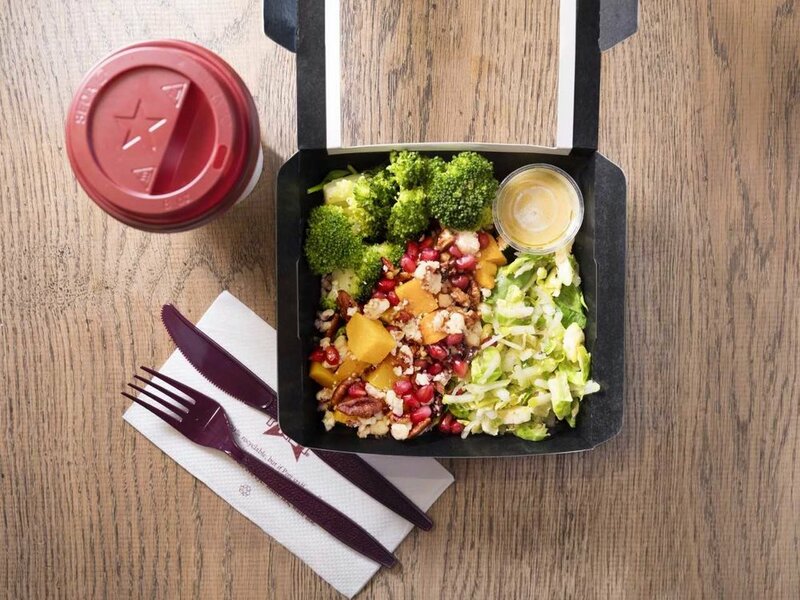 Below I've disected Pret's festive menu to share with you the best festive options. Swap the Butternut Squash, Wensleydale and Cranberry sandwich for the Festive Winter Salad: Whilst they both have similar ingredients there's a big difference between these two dishes. The Festive Winter Salad is packed with warming roasted squash, apples, sprouts, spinach and pomegranate to add to your 5-a-day. It also contains a couple of festive ingredients too including cranberry wensleydale. At 228kcal per portion and 10g of sugar (which is pretty good for a festive dish) it leaves you with some room for an extra snack too. It also contains 10g of protein to help keep you fuller across the afternoon. The sandwich will pack in 540kcal and 2.4g of salt (which is over a third of the recommended daily amount). Swap the Mint Hot Choc for the Mint Moca: Winter is the time for hot chocolates and I'm not going to be the one to deny you of this tradition and one of your favourite winter warmers. However, I recommend you be aware where you get it from. Often you're better off making your own hot chocolate. The pret mint hot choc contains 44.5g of sugar in one serving. That's over a third more than your whole daily recommendations. Plus if you combine that with the christmas muffin you're likely to pick up with it you're in for a whopping dose of 80.5g of sugar. The mint moca contains 20.7g of sugar (that's over 50% reduction) and so whilst it's still a considerable amount it's a much better option than the mint hot choc. Swap the Christmas Muffin for the Mince Pie: Both items will provide you with those christmas spices but there's a significant difference in the sugar contents. The muffin comes in at 36g of sugar per serving. The mince pie contains 11g of sugar less wtih 24.1g per serving. These numbers are both considerably high however, if you're going to enjoy them know what you're eating and try and limit your sugar across your snacks and meals throughout the day.